Keep water available for livestock with help from the Farm Innovators Floating Convertible Tank Deicer. Deicers help livestock obtain the water they need by preventing a section of water from freezing, keeping it useable for the animals. This innovative unit can either be used as a floating deicer, by placing it in the tank, or as a standing deicer by installing the included legs onto the base. Simply unscrew the top of the unit from the base, and install the four 2.25" long plastic legs onto the holes on the base. Then reassemble the unit and it is ready for use again. The thermostatically controlled heating element uses 1250 Watts of power, and is designed to warm the water only when the temperature approaches freezing, and to turn off automatically when the temperature rises. The cast aluminum heating element can be used in plastic and metal tanks, and the 71" long cord is covered in a chew-resistant metal spiral. The blue color adds a fun look to the piece, while the metal base keeps it sturdy. 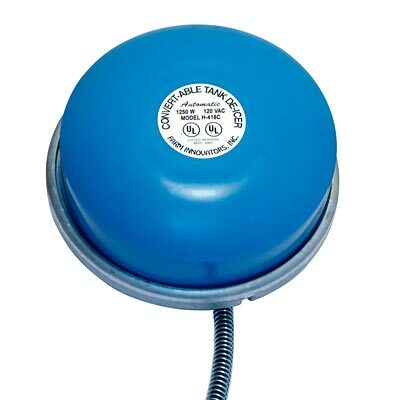 Offer water to your livestock year round with this Floating Convertible Tank Deicer. Made in the USA. Three year warranty.